Connect your enterprise to a wide range of SaaS platforms, Open APIs, and social networks quickly and without difficulty. 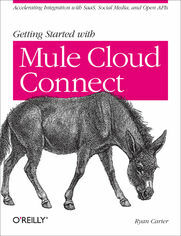 Through step-by-step instructions and numerous real-world examples, this concise guide shows you how to seamlessly integrate the external services you need with Mule ESB and its powerful Cloud Connect toolset. You&#8217;ll learn how to use service-specific connectors for many popular APIs&#8212;including Salesforce, Twitter, LinkedIn, and Twilio&#8212;through easy-to-learn abstractions. If Mule doesn&#8217;t have a connector for the resource you need, you&#8217;ll learn how to build your own. You&#8217;ll discover how easy it is to reach beyond the enterprise firewall for a host of Internet resources.